Widow’s Christian Place: Sharing Gina Garrett's "Musings of a Middle Aged Woman"
Sharing Gina Garrett's "Musings of a Middle Aged Woman"
I started this blog intending it to be light-hearted and fun. But to be honest, I haven't had a lot of "light-hearted and fun" things to say and so, I haven't said anything. And yet, I feel compelled to write. More than in a long time. So, I will let the Lord lead the tone of my blog and blog whether the words are light-hearted or heavy; fun, funny, or sad; on-top-of-the-world or in the depths of despair. For that is life - for everyone - and certainly for those of us on a grief journey of any kind! Today, I want to talk about the sunflowers in the gully behind my house. We purchased this house just a couple months after Al's diagnosis. We sold our home of nearly 20 years and moved out here where we would be near our girls and where I would not have a house payment after his death. It was a good move, miraculously facilitated by God. Al and I lived here together for almost exactly six months. Then he was gone. It was never really "our" home. It was the place where I brought him to die. In the early days after he was gone, I hated it here! I couldn't feel him or picture him except ill, fading away, dying. I wanted to go back to our home, where we had lived! At the very least, I wanted out of this horrible place of sorrow! I did a lot of running, trying to escape it, but the sorrow always followed me wherever I went. It still does. I am making peace with my house though. I have changed some things. I rearranged the bedroom so that it was convenient for me rather than for my invalid husband. I got new furniture for my living area and office. I redid my kitchen. I am preparing to dismantle "his" room (painted the color he chose and set up with all the hobby things he loved, created for his enjoyment) and make it mine. Changes. They are part of the process. Some good, some not, but part of it. One of the things that we enjoyed together though, in this house of death, was the sunflowers in the gully behind the house. In the early days, before the hospital bed took over the dining room, we would sit at the dining room table, looking out the wall of windows at the beautiful view of God's creation behind us. Most of the area where I live is flat. You can see for miles! But there are canyons and mesas dotted around and I live in one of those areas, on top of a hill with a fairly deep gully behind my house. 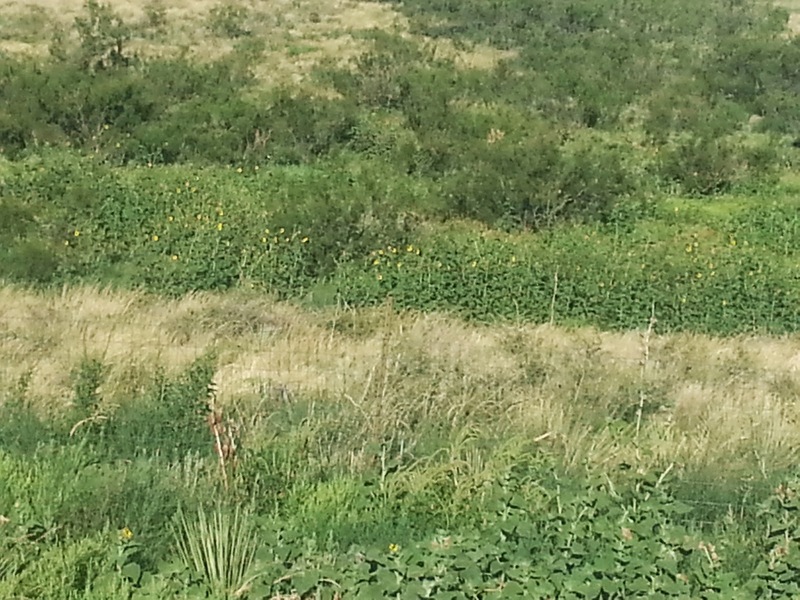 There are lots of grasses and wild flowers, yucca plants, rocks, etc. 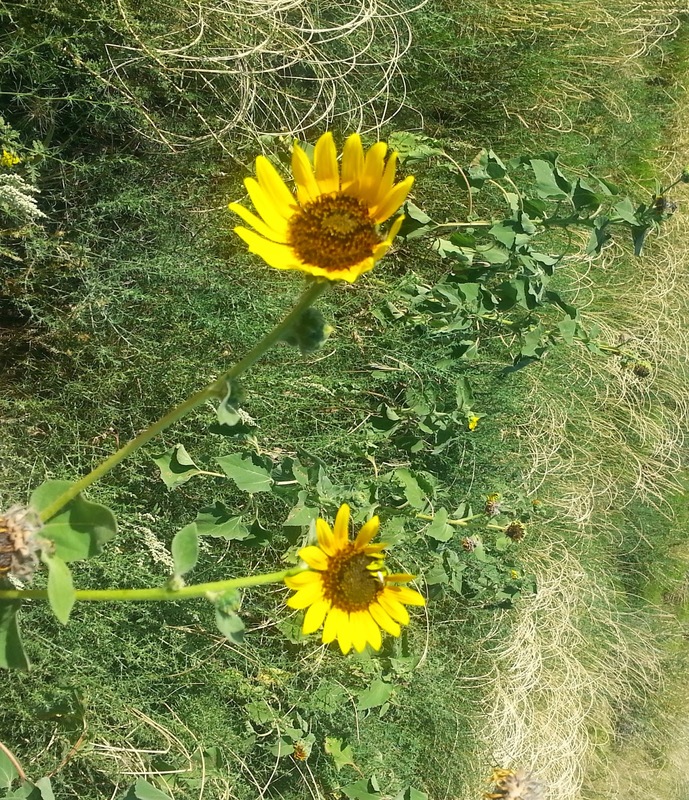 and, at the bottom of the gully, sunflowers. Hundreds of sunflowers! At a time of pain, sadness, impending death, the happy, dancing sunflowers brought us joy. We used to sit and watch them bouncing happily in the breeze, their bright yellow heads dancing and swaying to the music of the wind. They were a happy sight! And we watched them for hours at a time. While eating. Or holding hands. Or talking. Or just sitting together. Last year, the sunflowers didn't bloom. I waited for them. I wanted to see happy. It wasn't there. Anywhere. June. July. August. September. No happy sunflower dance. Somehow it was fitting. This year, the sunflowers are back! I didn't think they were coming! I saw them growing, getting taller, but no evidence of blooms. Then, about two weeks ago, buds began to open. Just one or two at first. I wasn't really sure they were actually flowers. But, yes, they were. Then a few more. Then more. Now, long before they are done, for there are many, many more buds, there are hundreds of happy, dancing sunflowers in the gully behind my house. Copyright 2014 by Gina Garrett. Used by permission. Visit Gina's blog here http://ginasmusing.blogspot.com/search?updated-min=2015-01-01T00:00:00-06:00&updated-max=2016-01-01T00:00:00-06:00&max-results=50 to enjoy much more of her insightful writings. Hope gives our hearts wings. Hope in Jesus makes us fly like eagles. Thank you for sharing this story of Gina's. God clothes the lilies of the field, and now I know He does the same for sunflorwers.... very fitting, always. This touched m heart in every way. Thank you Gina.